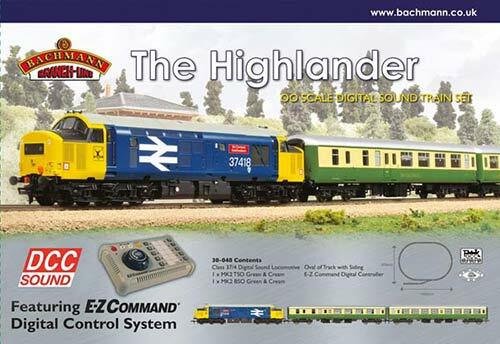 On Friday Bachmann have released details of 3 new train gifts pack and 4 trains they will be releasing in 2014. The gift packs have been designed to evoke the nostalgia of Britain’s historic railways. Like the Hornby train packs they feature certificates and exclusive products, these packs make wonderful gifts for the seasoned collector or that special someone. Unlike the train sets they sell, these packs do not feature track but instead feature a locomotive and rolling stock. Some of the packs also include extra compatible products such as figure packs or buildings. The first of the new train packs in OO scale is ‘Ambulance Train No.40’, a GWR “City of Birmingham” City Class locomotive in WW1 khaki livery along with three Midland Railway crimson lake coaches. 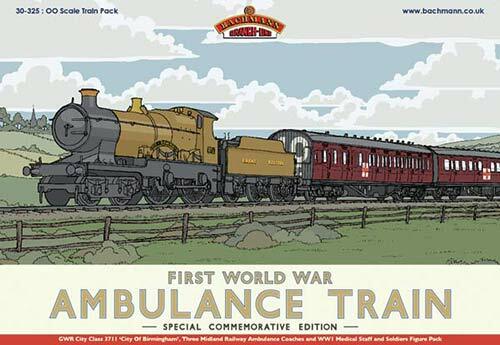 The train is accompanied by a specially commissioned WW1 medical staff and soldiers figure pack. This train pack is one of two produced by Bachmann Europe Plc to commemorate the 100th anniversary of the start of World War One. 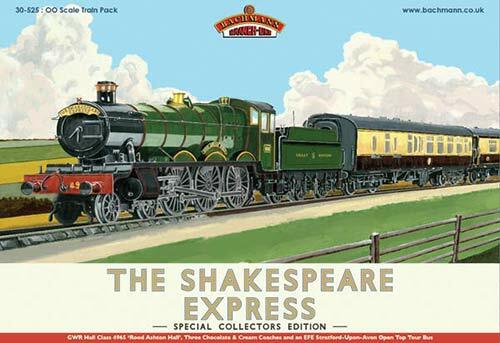 ‘The Shakespeare Express’ is the second of the new train packs, and is based upon the popular heritage steam rail tour that runs between Birmingham and Stratford-upon-Avon via the scenic North Warwickshire line. The real Shakespeare Express is operated by Vintage Trains in Tyseley, Birmingham and has proven very popular since its first running. Included in the pack are a Hall Class locomotive in Great Western “Rood Ashton Hall” green livery, two umber & cream Pullman cars and a chocolate and cream coach. There also looks to be a special headboard in the set which would amazing on front of the Hall. To complement the train, a Stratford-upon-Avon open top tour bus has been specially commissioned. 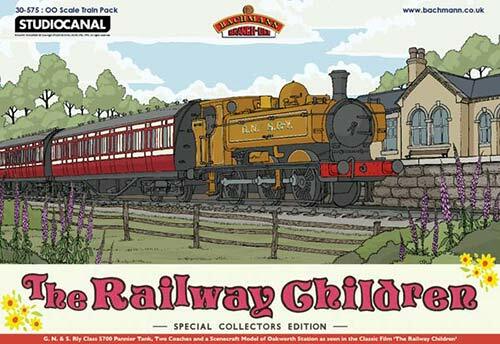 Finally ‘The Railway Children’ is the last of the new Bachmann OO scale train packs and is sure to delight fans of the film, both young and old. Including a GWR pannier tank in GNSR livery and two GNSR livery coaches (as featured in the film), a specially commissioned Scenecraft Oakworth station rounds off the pack and completes the scene. Now onto the train sets with the first being “The Western Wanderer” which features a 57xx pannier tank in GWR Green teamed with a shunters truck and toad brake van. Short goods trains and trip workings such as these were once a familiar sight over the entire railway network. The Bachmann 57xx Pannier is a fantastic little model and would ideal in a starter set. Up next is the ‘The Highlander’, a Class 37/4 BR Blue locomotive with green and cream coaches. This is the first Bachmann train set to feature digital sound and noises to be heard include engine revving, horns, inertia bypass, spirax valve and shunt mode. This set is based on a train service running on the famous West Highland Line “The Road to the Isles” in Scotland. The third OO train set is ‘The Midland Marvel’. 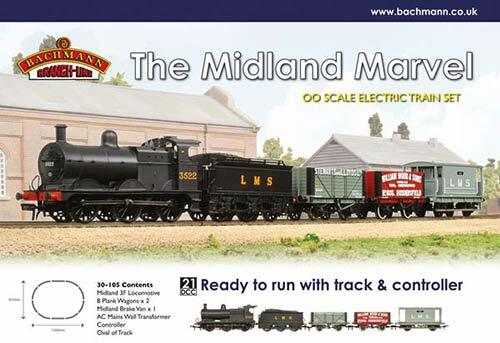 A must-have for freight fans, this set features a Midland 3F in LMS Black, two 8-plank wagons and a Midland Brake Van. Coal was the lifeblood of industry and its transportation sparked the need for the railway networks. The final set is ‘the ‘Thames Clyde Express’, featuring a Midland Compound in Midland Railway livery and three coaches with Midland-style lining. 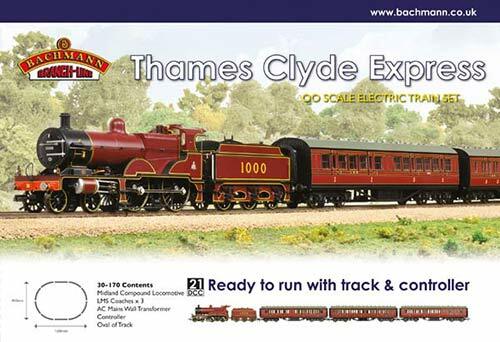 This set is based on the famous Thames Clyde Express, an express passenger train that ran on the Midland Mainline. For me personally I think this would be more attractive set if it was a train pack rather than a train set. The new releases look amazing and I cant wait to see what they look like closer to the release date.